Please note that this trail is for the very fit and serious trekker, and requires participants to be able to hill trek for several hours per day in tropical and humid conditions. ➢ You are interested in wildlife, conservation and the natural environment. ➢ You are interested in indigenous people and their way of life. ➢ You are really adventurous. ➢ You are used to outdoor activities. ➢ You are physically very fit and do not mind to rough it out. 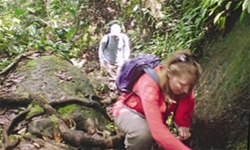 ➢ You will be able to trek for several hours a day in hot and humid tropical conditions. ➢ You have no problem carrying you own personal belongings. ➢ You do not mind to sleep overnight in the jungle in a hammock just sheltered by a canvas. ➢ You do not mind to get wet and dirty. ➢ Leeches and similar creatures do not put you off. ➢ You will have no problem eating simple meals prepared over an open fire. ➢ You do not mind to return with sore muscles, blisters etc. In line with our commitment to responsible tourism, all guides and assisting staff on this trip are local people from the Iban tribe. All of our guides and assisting staff on this trek are committed to the conservation of Borneo’s primary rainforest and educate each group about the local wildlife, flora and indigenous populations that live in the Sarawak and the surrounding area. This trek is a great way to reduce your carbon footprint with the majority of the tours using people power such as walking or Swimming. The tours are designed for small groups to ensure minimal impact to the local environment. We also provide clients with a list of things they can do to reduce their impact on the environment whilst on the trek such as using biodegradable soaps and packaging’s. Going Remoteness Into The Heartland Of Borneo segment of this tour is built up around the Batang Ai/Jingin and with the help from the local people from this community. 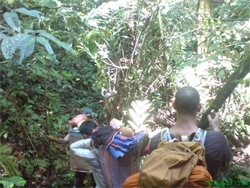 Trekking in this region brings an income to a very remote community. A percentage of the money from the trek goes to support the local communities by using local produce and handicrafts. 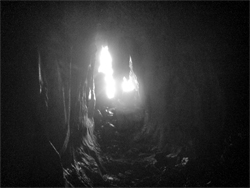 The accommodation whilst on the Going Remoteness Adventure has been chosen for its responsible environmental policies. The accommodation has been designed to fit in with the natural environment by using native building materials and the accommodation is keeping with the traditional designs of longhouses. The accommodation has also been chosen for the minimal impact it has on the environment for example the hotels and lodges do not wash linen every day. Furthermore the Borneo Going Remoteness Adventure tour focus on conservation of the orangutans particularly, rainforest and the wildlife in general. Meet in the hotel proceed with visit to semenggoh to meet the O.Utan here as warming up and continue the journey overland to Batang Ai Boat jetty which take you approximately 4 hrs. On arrival, continue journey by longboat through the man made lake to an Iban Longhouse which take you approximately 1 1/2hrs. Check-in at the Longhouse, joints the longhouse folk and observe their way of living. Try the rice wine call ‘Tuak” and Overnight stay at Iban settlement. After breakfast, proceed with 6 hrs trekking to Tutong, the virgin jungles in the Batang Ai and proceed on trekking along the Nature trail where you can encounter animals and Orang Utan, also learn about the plants along the trails. Packs lunch along the trails. 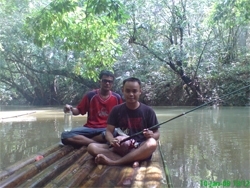 Spend the whole day in the jungle before choosing the camping site in the late afternoon for the night. Dinner and overnight stay. Breakfast, start the trekking to spot the Orang Utan, strenuous trek involving 4 – 6 hours trekking till reaching Lubang Baya. Boarding the longboat and proceed upriver to set up the camp for overnight. Experience the rainforest at night. Dinner and settle for the night. Breakfast, start the trekking to spot the Orang Utan, strenuous trek involving 4 – 6 hours trekking through Batang Ai virgin jungle for Orang Utan spotting and others wildlife. Pack lunch and trek back return to the camp site, free at leisure and overnight. After breakfast, free at own leisure prior transfer to Kuching Airport for your flight back home or Kuching city hotel. Lunch enroute. Tour Ends. : Airfare, Airport Tax, Tipping, Optional Tour, Tours and Travel Insurance & Personal MISC Expenses, alcoholic drink and things not mentioned. Please take note that this tour is only for the very fit. For more details on the fitness level required to complete this trek please contact us. Surcharge MYR 60 per person for each transfer to/from Damai Beach hotels. Note Prices are subject to change without prior notice. This tour is offered on a ‘Seat-in-Coach’ basis.